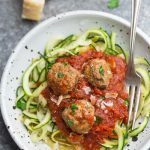 Zoodles with Meatballs – the perfect low carb / keto-friendly gluten free “pasta” dinner. 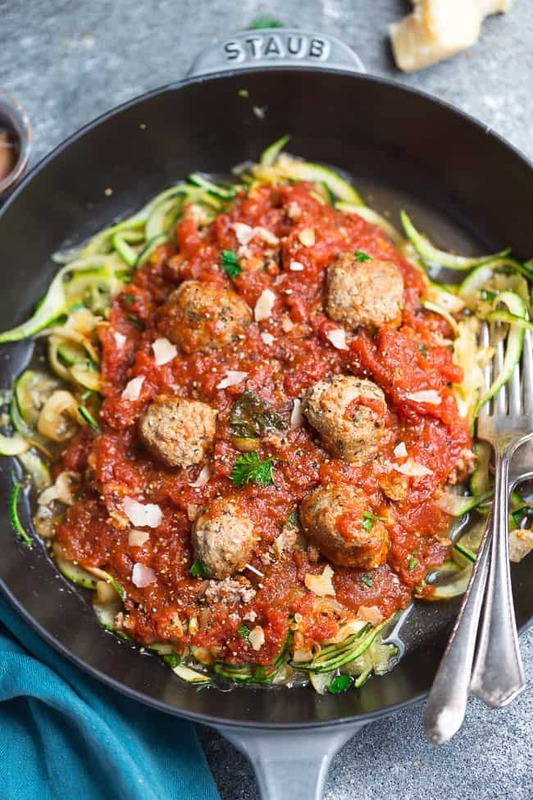 Made with a homemade or jarred marinara sauce and spiralized zucchini. Spiralized zucchini noodles are one of my favorite ways to use up our garden zucchini. 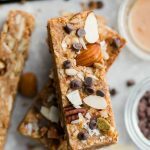 They make a healthy grain free noodle option and are super simple to customize. 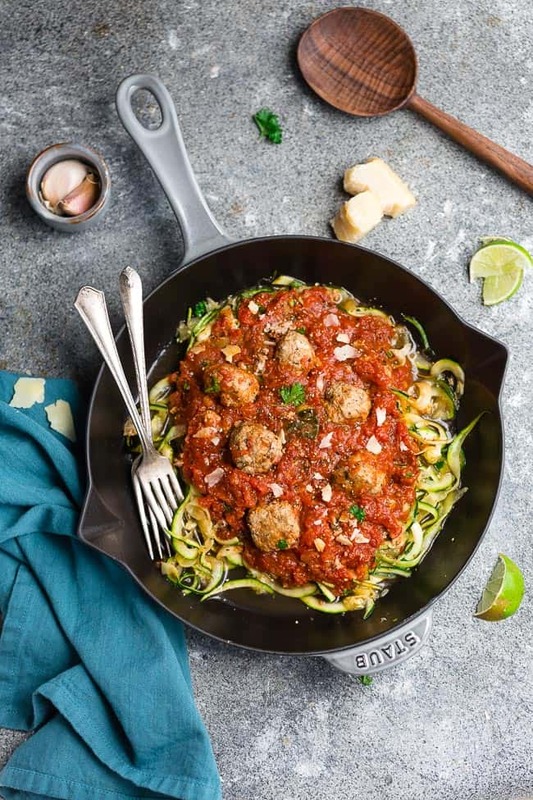 This recipe for Zoodles with Meatballs is a lightened up and a healthier twist when you are craving a comforting plate of Spaghetti and Meatballs. To make the meatballs, combine the ground beef, turkey, cheese, Italian seasoning, salt, pepper, onions and garlic together. Stir in the eggs, almond flour and fresh herbs until just combined. Lightly oil your hands and roll round forming into 1.5″ balls. Fry in a large 12″ skillet for 8-10 minutes or until all sides are brown. 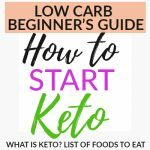 Or alternatively – you can also place the meatballs in a large baking dish in a single layer and bake at 415 F for about 15-20 minutes or until cooked through. Absolutely. 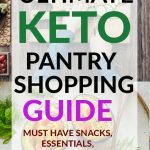 You can make a batch on meal prep Sunday (or Monday) and heat them up as needed. 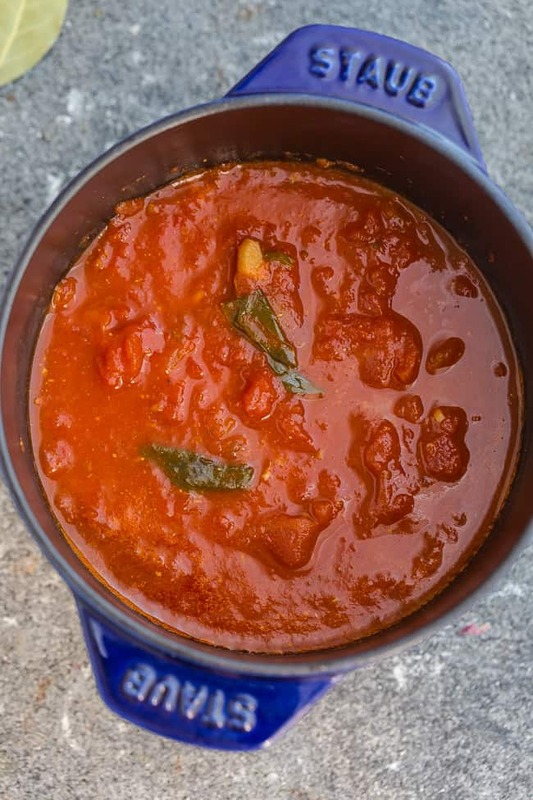 Making your own pasta sauce from scratch is not hard at all. But if you’re pressed for time, you are more than welcome to use your favorite jarred brand. You’re going to start by sauteing the onions, carrots and garlic until softened and fragrant. Season with salt and pepper. Add the tomato paste, crushed tomatoes, beef broth, oregano and bay leaf. Bring to a boil and simmer gently until thickened. Add basil and adjust seasonings as needed. And just like meatballs, the great thing about making a batch of homemade spaghetti sauce is that it it is also freezer-friendly so you can make this meal ahead and help cut down on prep time when you’re ready to serve. 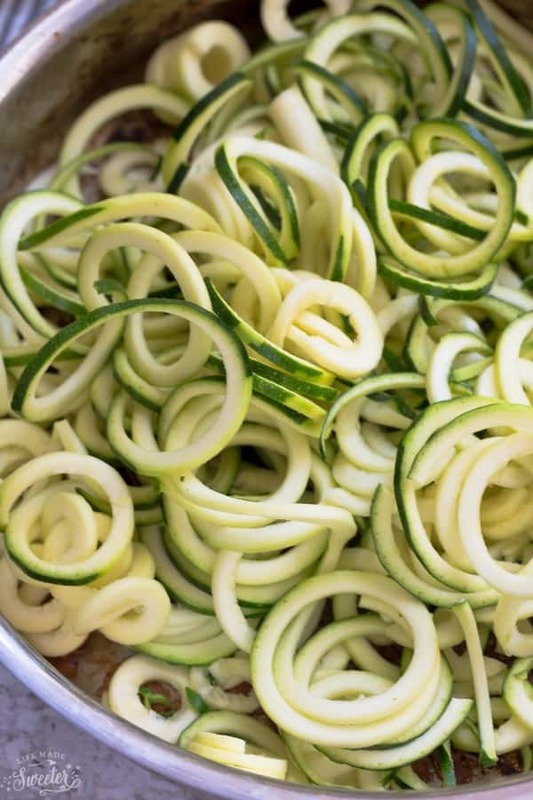 Make your zucchini noodles by using a spiralizer, mandolin or a vegetable peeler. Lightly oil a pan and place the zucchini in for 1 1/2 – 2 minutes. Toss to cook. (do not overcook). Skip this step if you prefer your zucchini noodles raw. Transfer noodles on a dish and serve with a few meatballs along with the homemade (or jarred) pasta sauce. Sprinkle with chopped parsley and Parmesan. FOR THE TOMATO SAUCE (can also use jarred marinara sauce). Combine the ground beef, turkey, cheese, Italian seasoning, salt, pepper, onion and garlic together. 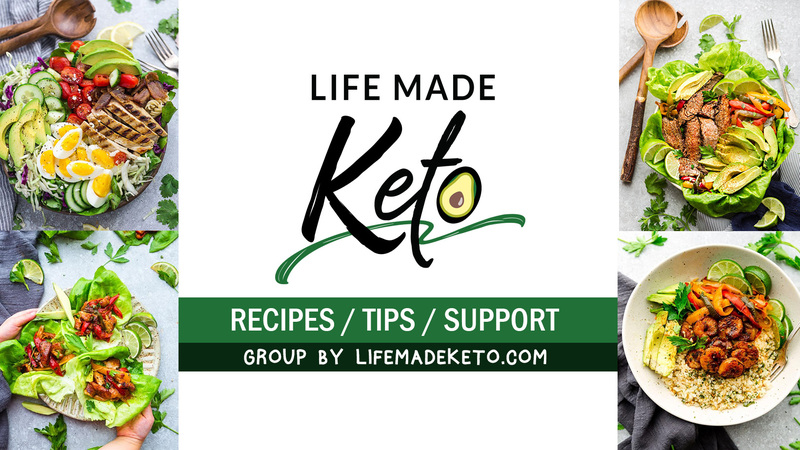 Stir in egg, almond flour and parsley until just combined. Do not overmix. Using your hands, form into round 1.5" meatballs. Heat 2-3 tablespoons oil in a large 12" skillet on medium heat. Add the meatballs in a single layer and cook for 8-10 minutes, browning on all sides. Transfer to paper-lined plate and repeat, if necessary with remaining meatballs. TO COOK IN THE OVEN: Preheat oven to 415 F. Place the meatballs on a large baking sheet lined with parchment paper, in a single row. Bake for 15-20 minutes, or until cooked through. 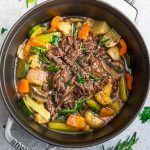 Discard oil and wipe down the same skillet. Heat 2 teaspoons olive oil on medium high heat. Add onions, carrots and garlic and cook until softened and fragrant. Season with salt and pepper. Add tomato paste and cook for 30 seconds. Add the tomatoes, broth, oregano and bay leaf. Bring to a boil and simmer gently until sauce thickens, about 20 minutes. Stir in basil and adjust seasonings as needed. Add the cooked meatballs and simmer, until heated through. Spiralize zucchini using a spiralizer or vegetable peeler into noodles. 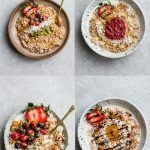 At this point, you can divide into bowls if serving raw. To cook zoodles, lightly oil a pan over medium high heat. Add zucchini and saute for 1-2 minutes or slightly softened but still tender. Do not overcook. 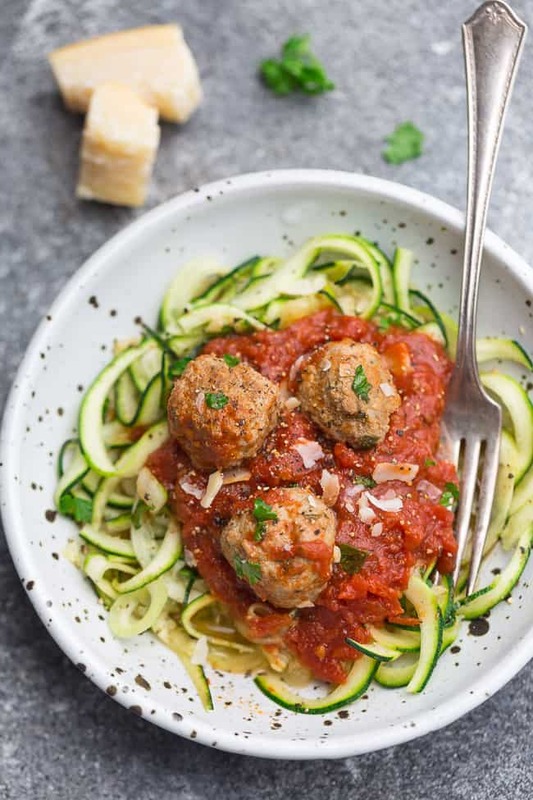 Transfer to bowls and spoon sauce and meatballs over zucchini noodles. Sprinkle with freshly chopped parsley and Parmesan cheese, if desired.